A proposal by President Obama to offer free tuition for students attending community college could have a significant impact on Hispanics. 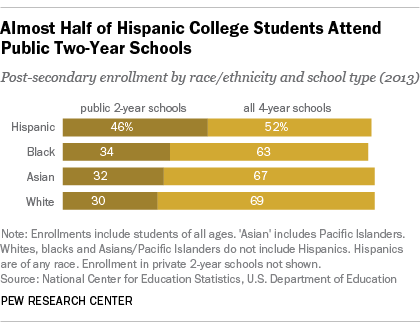 More Hispanics are already enrolled in college than ever before and, among those who are, nearly half (46%) attend a public two-year school, the highest share of any race or ethnicity, according to U.S. Department of Education data. Hispanics make up a growing share of the nation’s nearly 7 million community college students. In 2013, 22% of all enrolled public two-year college students were Hispanics – a greater share than their makeup of all students – and that figure has risen from 14% in 2000. The share of black students in public community colleges increased at a much lower rate over the same time period, from 12% to 15%, while the share of white and Asian/Pacific Islander students declined. There are several possible reasons why Hispanics who attend college are more likely than other students to pursue higher education at a public two-year school. Community colleges generally cost less to attend than four-year schools, and Hispanic college students are more likely than whites to come from a lower income family. For example, about half of dependent Hispanics enrolled in two- or four-year colleges have family incomes below $40,000, compared with 23% of white students. In fact, in a 2014 National Journal poll, 66% of Hispanics who got a job or entered the military directly after high school cited the need to help support their family as a reason for not enrolling in college, while 39% of whites said the same. A second reason why Hispanics may attend two-year colleges over four-year colleges is that community colleges have open enrollment, meaning that students only need to earn a high school diploma to gain admission. This can help students who are less prepared for college. Hispanics, on average, have lower levels of academic achievement than whites. The average SAT math score of college-bound Hispanics is 461 (out of 800), compared with 534 for whites. Hispanic high school drop-out rates have fallen drastically in recent years, and college enrollment rates among 18- to 24-year-old Hispanic high school graduates have been on the rise. Meanwhile, education continues to be a top issue for Hispanics. The Pew Research Center’s 2014 National Survey of Latinos found that 49% of Latino adults consider education an extremely important issue for them personally, on par with the percentage that named jobs and the economy (46%), but ahead of health care (40%) and notably, immigration (31%). Hispanics also see education as a ticket to the middle class. While six-in-ten (61%) Hispanic adults said a college education is needed to belong to the middle class, 49% of blacks and 29% of whites shared this view, according to a 2012 Pew Research Center survey.